Take good care of your Tamagotchi characters and watch them grow! Play mini games, make friends, explore Tamatown and customize outfits and the town itself for memorable moments you’ll want to share with your friends. Depending on the care you provide and the things you do, they will evolve into different Tamagotchi characters as they grow. And when your they are all grown up, help them choose the best career path, be it scientist, rockstar or detective! – RAISE your Tamagotchi character: make sure you feed, wash, clean up after it and turn the lights out for a good night sleep to stay happy and healthy. 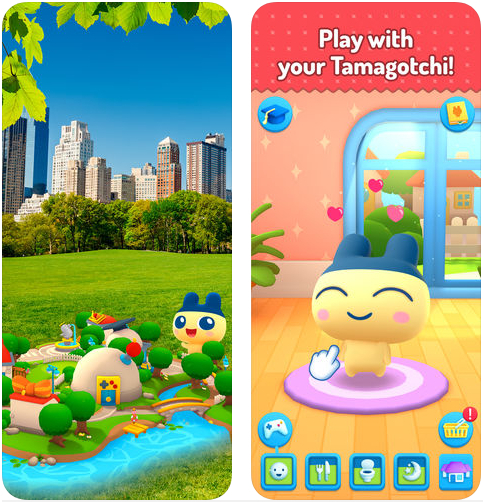 – HAVE FUN with your Tamagotchi character: play mini games and explore Tamatown together, making friends with other Tamagotchi characters along the way. – EXPERIENCE AR by playing exhilarating Hide & Seek games with your Tamagotchi friends in your real surroundings! – EVOLVE your Tamagotchi characters from one type to another depending on how you care for them. You never know who they might become next! – COLLECT memorable moments shared with your Tamagotchi characters and the friendly town citizens. – SHARE your favourite moments with your friends. – GATHER coins by playing mini games and levelling-up! – UNLOCK delicious food, cute costumes and colourful items to decorate Tamatown. – COMPARE your progression and Tamagotchi-raising skills with your friends. – TICKLE your Tamagotchi characters – they love it!